These pictures were taken during this year's Cherry Blossom Festival; the first week of April. 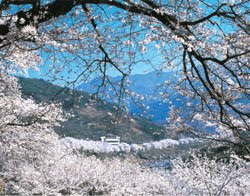 Cherry Blossom reminds me of the movie Memoiers of the Geisha because there are ome scenes there with CB flowers. One of my friend here, makes a document of the stages of this charming flower from the erupting of the bulbs, when it blooms and until it fall off the ground. I find it a pretty neat idea. Isn't it amazing how God made everything beautiful? Thank you Lord that You made me experience all these! Do you eat kielbasa (pronounced as Kabasi)? I was craving for that smoked sausage that my father in law used to cook in his house. So when we went to the big commisary in Daegu today, we bought two packages of it along with a big jar of sauerkraut (firmented cabbage). When we arrived home, hubby cooked it. 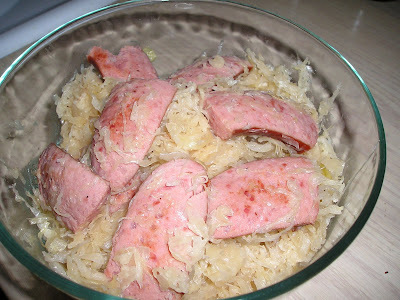 It's easy to prepare, you just basically slice the sausage and add the sauerkraut and bring it to a boil, add some black pepper and tadah, good meal na. Hubby added a little bit of Michelob light beer to take away the sourness of the cabbage.